A high school valedictorian claims she was censored when her mic was cut off whilst referencing an alleged sexual assault during a graduation speech. 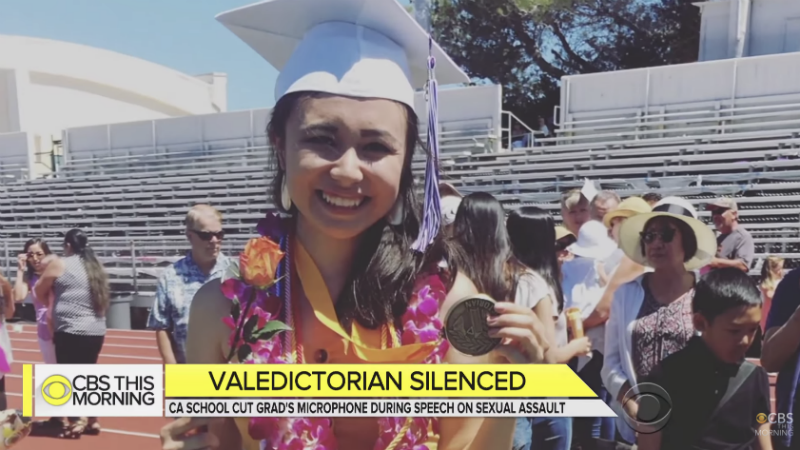 Seventeen-year-old Lulabel Seitz of Petaluma, California told CBS News that she wanted the speech to, “remind her classmates of the obstacles they’ve overcome.” One of Seitz’s obstacles: an alleged sexual assault. Seitz claims Petaluma High School didn’t take the on-campus assault seriously enough, despite that she filed a police report. She also didn’t think the school did enough to protect her following her attack last fall. School officials weren’t as inspired. Petaluma High School warned Seitz multiple times that her mic would be cut off if she went off the pre-approved script.